This week's feature was sent in by a reader... and one of my personal best friends... Sabrina. She is also very crafty and while she was crafting she turned over her product and wowzer it was Made in USA so she snapped a picture and sent it my way. Sorry the picture is a little blurry... phone camera. 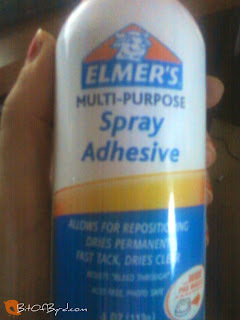 Like last week since the featured product is Elmer's Spray Adhesive I thought I would tell you a little more about the product. Sabrina uses it in her crafts and with her ribbons. I used it in college while working in a media studio. Pinterest has some awesome craft ideas that use Elmer's Spray adhesive. Check them out here. Have you used Spray Adhesive before? What did you use it for? How did it turn out? 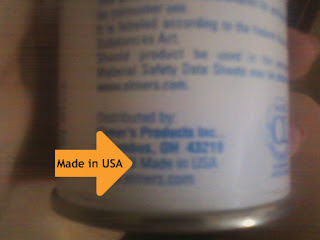 Remember to share your other Made in USA finds with me!